In this case, the conditions at the bottom of the sea did not allow the formation of compact layers of limestone. We can observe rounded masses of calcium carbonate (nodules), which are aligned and deformed. Some sandstone strata show ripple marks of flowing water on their surfaces. These marks almost reach a few centimetres in height. The different types of sloping layers reflect the erosion caused by the current transporting, grain by grain, of sand from the bottom of the sea. The forward movement of the dipping faults gave rise to a group of folds, among which we can find the Añisclo Anticline. As the deformation moves forward, it even breaks in its inner zone, allowing the erosion caused by the Bellos River. 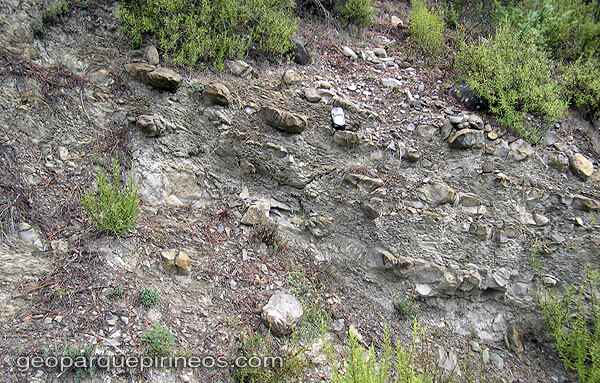 During the formation of a dipping fault, the older rocks were moved on top of other more recent ones. Here, we can observe how the huge compression forces folded the rocks. 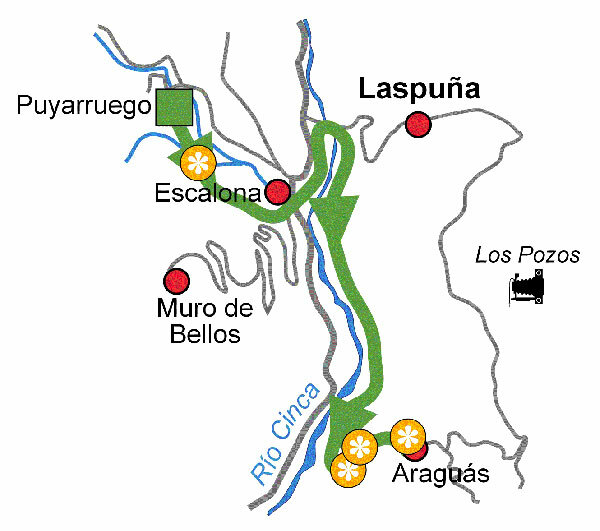 Mapa Route map highlighting the points of geological interest along Route 7. Puyarruego-Escalona-La Espuña Bridge-Cinca Breakwater-Araguás Drawer-Araguás.